COH - eena ferroix from COH on Vimeo. Picking up right where the last track on the previous COH release RETRO-2038 left off, the new album is focused on the use of beats within the similar aesthetics. While most of the previous COH records openly shy away from accentuated beat structures and instead build up their rhythmical content by layering waves and pulses, every track on TO BEAT is padded with just that - beats. 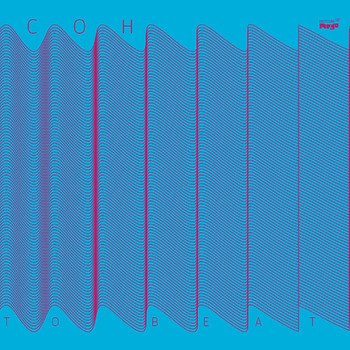 The music transition is illustrated in the album's artwork, displaying transformation of a sine-wave, a tone, into a waveform which is "beat". This mathematical progression is made audible in the album's opening track WAVE TO BEAT. The rest of the album, however, steers clear from dull math and presents the beats in their more traditional context of what could be referred to as "adventurous dance music", taking the listener through various examples of beat use with the sense of playfulness and joy. The final piece, BEAT TO WAVE, wraps it up by dissolving a simplistic post-techno piece into a tonal chord. This brings back the album's main idea, where tone and beat are essentially one and the same, like vowels and consonants in a language, like Yin and Yang in music.